For curator Chloe Ellefson, a family bonding trip to Decorah, Iowa, for rosemaling classes seems like a great idea—until the drive begins. Chloe’s cop friend Roelke takes her mother’s talk of romantic customs good-naturedly, but it inflates Chloe’s emotional distress higher with each passing mile. After finally reaching Vesterheim Norwegian-American Museum, Chloe’s resolve to remain positive is squashed when she and Roelke find Petra Lekstrom’s body in one of the antique immigrant trunks. Everyone is shaken by the instructor’s murder, and when Mom volunteers to take over the beginners’ class, Chloe is put in the hot seat of motherly criticism. As she investigates, Chloe uncovers dark family secrets that could be deadly for Mom . . . and even herself. It may be subconscious, but we all address that question in a myriad of ways throughout our lives. And it’s a question that museum curator Chloe Ellefson, protagonist in my Historic Sites mystery series, confronts as well. Chloe has always taken her Norwegian heritage for granted. But in Heritage of Darkness, interviews she conducts with elderly Norwegian-Americans regarding Christmas folklore raise new questions about her ethnic identity. Chloe meets people who preserve traditions with festive decorations and cookie recipes—things she remembers from childhood. Other informants choose to perpetuate traditions that stretch back to pagan times, when many European peasants believed the coldest and darkest of winter days brought wicked spirits racing through the skies. Those people developed rituals intended to ward away evil. As a curator, Chloe wants to learn all she can about Norwegian folklore. But she also gets to choose which aspects of that folklore —if any—she will celebrate herself. Like all of us, she can embrace elements of her cultural heritage that appeal to her, while discarding others. 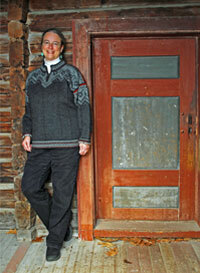 I don’t have Norwegian roots, but I enjoy exploring the complexities of cultural identity in the Chloe Ellefson series. The heritage of different ethnic groups plays a role in each book. So far I’ve developed mysteries that include folklore and customs celebrated by Norwegian, Danish, and Swiss immigrants. And I’m just getting started! So…how about you? Have you chosen to celebrate aspects of your own heritage? Have you blended traditions within your family? Do you choose to create new traditions? I’d love to hear your thoughts! 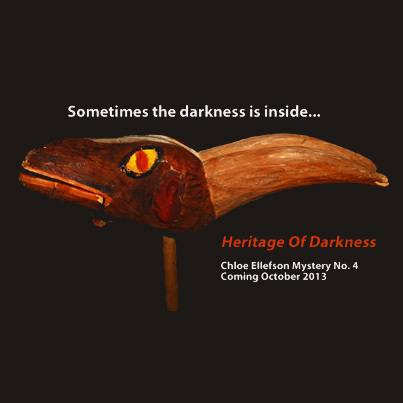 Leave a comment, and you’ll be entered in a drawing for your choice of Chloe Ellefson mysteries: Old World Murder, The Heirloom Murders, The Light Keeper’s Legacy, or Heritage of Darkness. Heritage of Darkness is Kathleen’s twenty-sixth published book. In addition to the Chloe Ellefson Historic Sites series, she has written many books for American Girl, including seven books about the newest historical character, Caroline Abbott. The latest is a Caroline mystery, Traitor In The Shadows. Several of her titles for young readers have been finalists for Edgar or Agatha awards. Kathleen lives in Wisconsin, but loves to travel to new locales for research! Visit her at www.kathleenernst.com/heritage, www.sitesandstories.wordpress.com, or www.facebook.com/kathleenernst.author. I don't have any special customs from my family to share, but it is always fun to learn about customs from other cultures and how they have changed over the years. And it's always fun to learn about a new author - I look forward to reading my first Sheila Boneham book. Thanks, Kathleen! Thanks, Lori! I'm so glad. I am anxiously awaiting the fourth Chloe mystery. I have enjoyed learning about the historical settings in Kathleen's books. LynMarie, I'm so glad you're enjoying the series! I learn a lot as I write the books too, and hope readers will enjoy them as much as I do. Thanks for stopping by and sharing your experience. I'm fascinated by the many ways that individuals and families go about finding a path that feels right to them about blending or mixing between different backgrounds. My Christmases at the age of 7,8,9, and 10 while I lived on an 80 acre farm consisted of home, Froelich grandparents, school, church, and the Plattdeutcher (a social group of a bar and dance hall + kitchen). The German background that I am from hardly shows other than most of the people involved all came from the same German heritage background. The Plattdeutcher was of German heritage as well as most the the town of Watertown. At the Plattdeutcher there was a Christmas program I took part in usually reciting something. The school was the typical one room schoolhouse play with the curtain put-up in the front of the room separating us from the audience consisting of the parents and other farm family neighbors. At church there was always the Christmas story play, but the bags of goodies were always the most desired because of the Angel food candy, orange, apple, and other candy under the big decorated tree in front of the church. I vaguely remember these performances. I was always interested in families because I was an only child and enjoyed going to visit and play with these other children. This interest with my farming background and study of Anthropology and Psychology in college led to my joy of working at Old World Wisconsin which lives on in Kathleen's books. This means I was also working at Old World Wisconsin while she was working there and come from that background of experience so I thoroughly enjoyed her fist book because I knew the settings which connected me with the personal feelings I had for the place. This newest book I am looking forward to because I know the story telling skills and accurate historical research she puts into her art. Thanks for sharing your memories! I wish I could have visited the Plattdeutcher Christmas program back when... And thanks for the kind words. My family has had some of the same Christmas traditions for as long as I can remember but every year we've been adding or changing some as my siblings and I get older. When I was in college, I wanted to string some popcorn for our family Christmas tree so I made enough to use instead of garland. Every year since then my parents have saved the popcorn strings and they continue to use it! My to-read list is increasing with the new Chloe book and now I'm interested in reading Sheila's books too. Carol, that's the fun of these blog tours, isn't it? We all get to "meet" books and writers we haven't see before, and readers who share some of our interests. So nice to have you here! Carol, I love the story of the popcorn strings. The first time I tried it I used popcorn that was too fresh, and so crumbled when I tried to slide the needle through. Once I figured out the mistake, I had much better success, and it was one of those things that really took me back to all the stories I'd read about popcorn strings on Christmas trees. I hope it's not too late to leave a comment to enter to win! I really enjoy the Chloe books! I especially like that they take place at historical places. My husband and I live near Old World Wisconsin, and our first visit was during Christmas. It was neat to go through all the buildings and hear the stories of the people who used to live there. Since then, we have visited Old World many times and I learn something new every time I go there. It's fun to read the Chloe books and know the places she talks about. When I was a kid, my aunt would give me an ornament every year at Christmas with the date on it. It's fun now to decorate the tree and look at all my ornaments from years ago. My husband and I have a tradition of buying one new Christmas decoration every year that we pick out together. Hi Kris - You squeezed in just in time! I'm so glad you enjoy the series. Thanks to all who stopped by, and a special thanks to Sheila for hosting me! Happy reading, everyone.